Dangers: the difference between poison and medicine is dosage. Large doses can cause severe diarrhea or other issues. Limit intake to 3 cups of tea, made with 1/2 teaspoon dried plant. Boneset leaves. Note how the stem seems to pierce the long, canoe-shaped leaves rather than having to distinct leaves, one on each side of the stem. 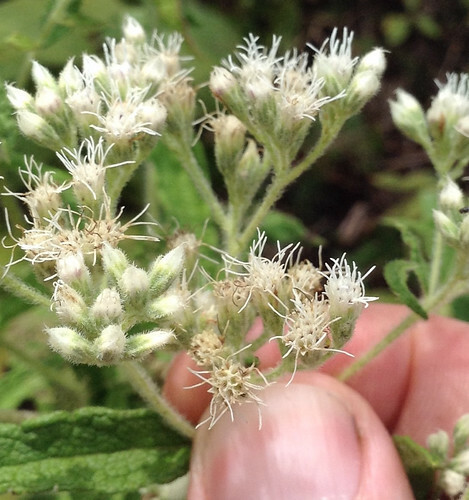 Boneset flower-cluster buds are hairy. Closer view of boneset flowers. Still closer view of boneset flowers. 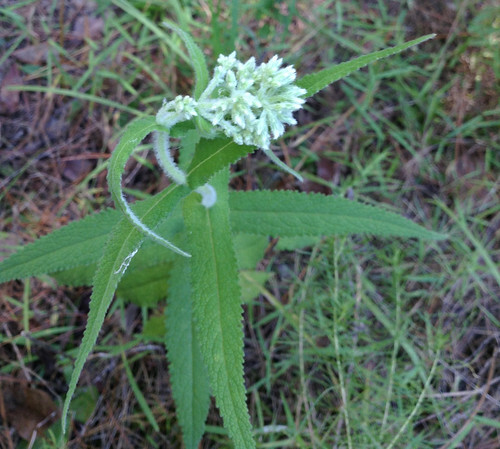 Boneset is a rather unique and easily identified plant. 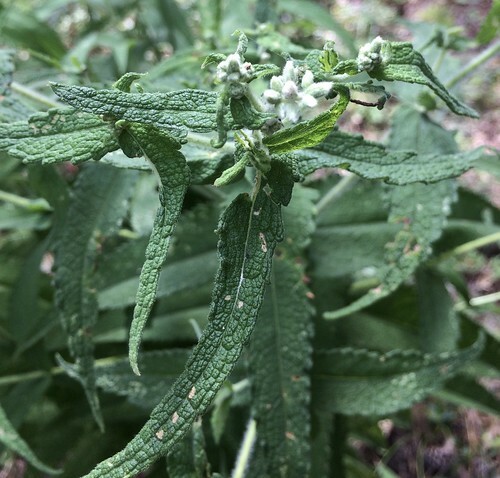 Appearing in the summer, there stiff, straight, hairy stems grow up to about four feet tall, with some branching occurring in the last foot or so. 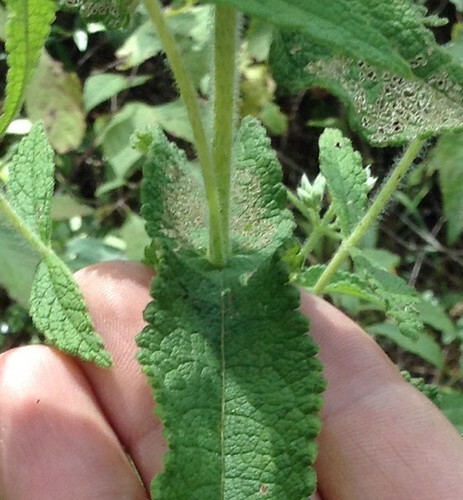 The really distinctive feature is its leaves. 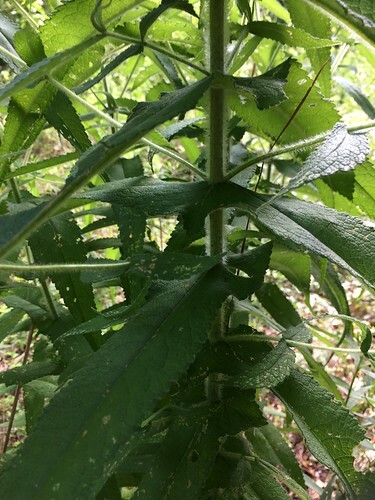 These long, narrow, pointed leaves are opposite each other on the stem but their bases fuse together so as to look like the stem grew through the center of an almost canoe-shape leaf. These dark green leaves are almost shiny but wrinkly on top and their undersides are mildly hairy. The edges of the leaves are toothed and the veins are pinnate with branching of the secondary veins of the main, center vein. In late summer the ends of the stem and branches have clusters of many white, hairy flowers, each about 1/4 inch across. 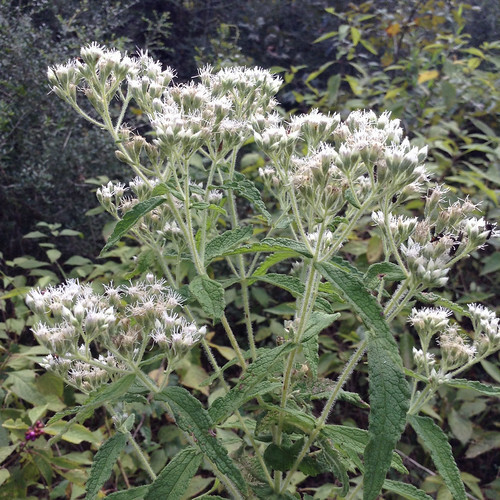 Look for boneset in low, damp, sunny areas such as roadside ditches and along creeks, or next to ponds in fields. 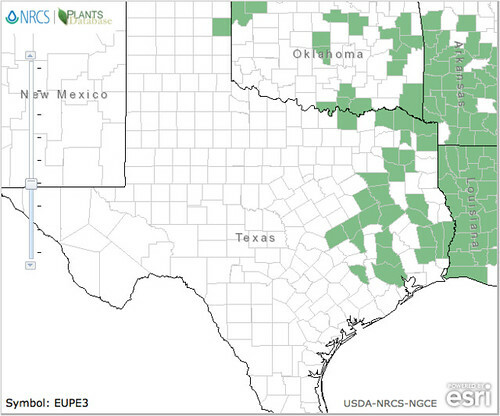 Goldenrod is often nearby. They can also be found growing along moist borders of woods, with hardwoods being a more likely companion than pines. 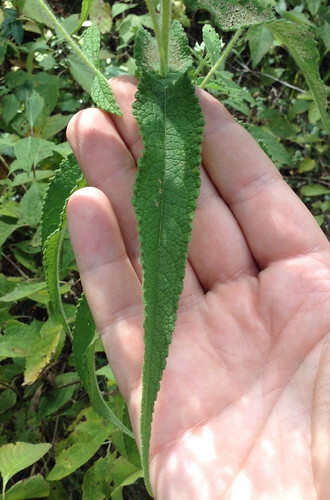 Boneset is used medicinally rather than as a food but is NOT okay for pregnant women. 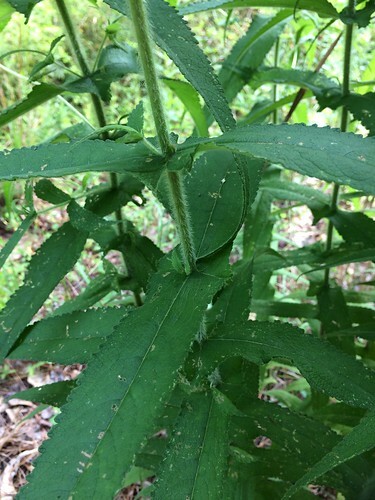 Boneset tea made from the flowers and leaves helps induce sweating, helps break fevers, and relieves respiratory problems of head colds and other illnesses, including coughing. It helps with inflammations, easing some of the pain of rheumatism and arthritis. The bitter flavor of the tea also stimulates the digestive juices, triggering hunger in someone who hasn't been wanting to eat. As mentioned in the Dangers at the top of the page, due to low concentrations of some toxic compounds, limit your intake to three cups of the tea per day, made with 1/2 teaspoon of dried boneset leaves and flowers. 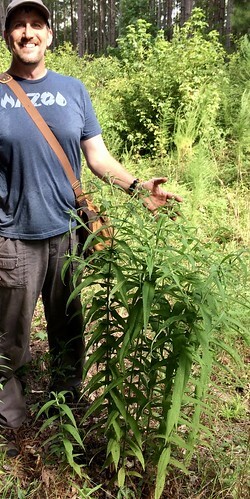 A tincture can also be made from boneset and 80-90 proof alcohol. 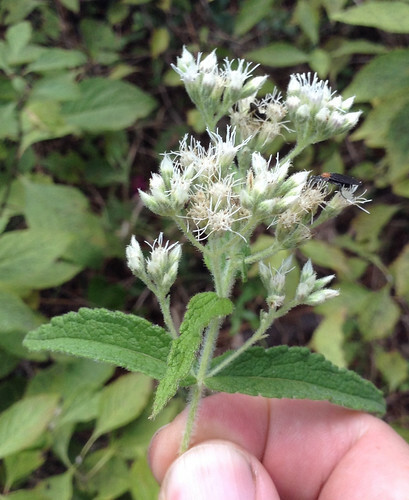 Boneset tinctures should be taken 1-4mL up to three times a day. 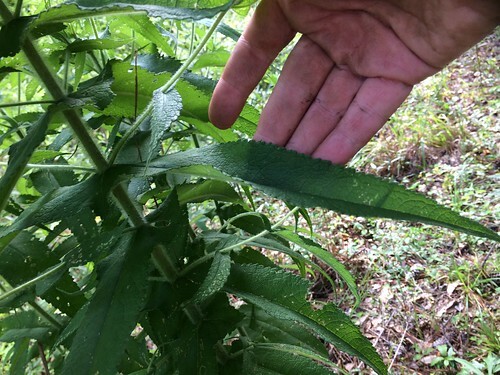 As a poultice, boneset leaves give relief and healing t0o many types of bone, muscle, and connective tissue injuries. It stimulates blood flow to the area and increases the speed of healing.